Rescue teams in Brazil are working for a second night to find 200 people believed to have been buried in their homes by a massive landslide. More than 50 houses were engulfed as mud and rubble poured into the Morro do Bumba shantytown near Rio de Janeiro. At least 170 people died after a week of heavy rain prompted mudslides and floods in Rio de Janeiro state. The soil is still saturated and local officials are warning that there could be further landslides. Although rescue teams were working through the night with floodlights in Morro do Bumba, there was little hope of finding survivors, says the BBC's Paulo Cabral in Rio de Janeiro, and the number of confirmed deaths is expected to rise steeply. The shantytown was built on top of a disused landfill which makes it prone to landslides, our correspondent adds, and the 300 rescue workers on the site are having to conduct their search with great caution. Officials are working to distribute 70,000 packs containing food, clothes and medical supplies for those left homeless by the flooding. The Brazilian government has announced an emergency programme to rebuild homes. The local authorities have requested more than $200m from the federal government to help them cope with the disaster. 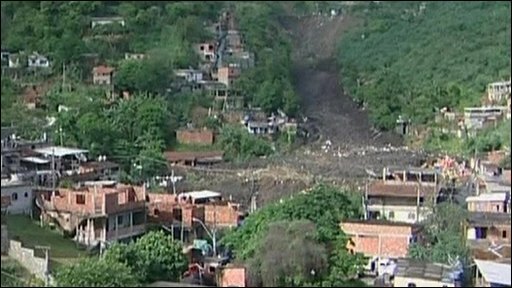 Some 20 people were pulled from the debris alive but civil defence spokesman Pedro Machado told the Globo news network that at least 200 people were feared buried in the landslide. "In our experience, it's an instant death [for those caught in their homes]," Mr Machado said. Downpours that began on Monday afternoon set off dozens of landslides. Most of the victims have been the residents of the shantytowns built on the hills around Rio, Brazil's second biggest city. 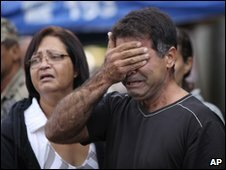 Rio Mayor Eduardo Paes said that up to 2,000 families would be moved from high-risk areas, but gave no further details. He said 4,000 families had been made homeless and 10,000 houses remained at risk, mostly in the slums where about a fifth of Rio's people live. Brazil's national weather service, Inmet, said the rainfall has been the heaviest in 48 years. Forecasters said rain was likely to continue, but would not be as heavy. Are you affected by the flooding in Rio de Janeiro? Please use the postform below to send us your contact details and experiences if you would be willing to speak to the BBC. If you have photos, you can send them to yourpics@bbc.co.uk, text them to +44 7725 100 100 or you have a large file you can upload here.